As I soon discovered, I wasn’t the only Florida Audio Expo attendee who decided to start at the top (Floor 8) and work their way down (Floor 2). 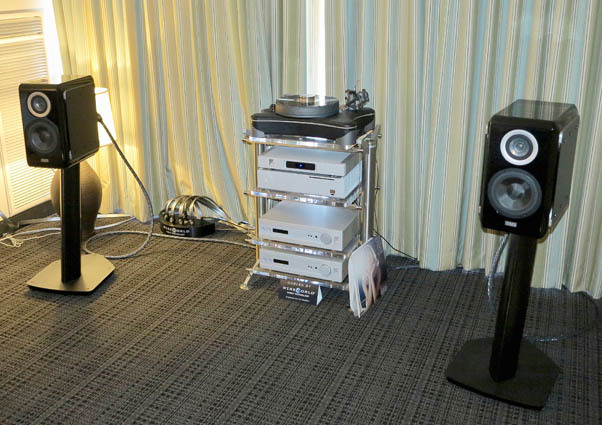 My first room, sponsored by House of Stereo, showcased Bob Carver’s attractive Crimson 350 monoblock amplifiers ($9500/pair), a Bel Canto Black EX preamplifier/DAC ($18,000), Wolf Audio Systems’ Alpha 3 music server with Flux Capacitor Clock ($6750), the striking KEF Blade Two speakers ($25,000/pair), new Audience Front Row cabling, and Stillpoints Aperture room-treatment panels. As I discovered soon after taking my photo, the sound was far more alive and three-dimensional when we opened the curtains behind the system. I wasn’t especially taken with Peter Schneider & The Stimulators faux-Armstrong rendition of “St. James Infirmary,” but I really enjoyed the fine sound, which included convincing bite on the guitar. As I was was also soon to discover, this was one of far too many rooms where I was more or less restricted to whatever music had been pre-loaded onto the exhibitor’s server. (Sometimes I offer my own files for playback, but faced with the prospect of covering 40 rooms in three days, I decided to mostly forego that time-consuming copy-and-load option.) We did find a hi-rez Vivaldi cantata on 2L: The Nordic Sound, which showed how nice and lively the system could sound. While the Wolf can process up to 8-channel DSD, it also grabs images from the net for display on the user’s computer screen. I may have found the visuals distracting, especially when they were not related to the performance at hand, but the room’s sponsor—House of Stereo proprietor Joseph Parvey—reported that his mother, who had boycotted the stereo system for 30 years, now loves being able to sit before the system and watch the images. Across the hall, House of Stereo had a very different system with different but no less pleasing sound. My notes are a little jumbled as to which tracks I heard on the Wolf Audio Systems Alpha 3 music server with Flux Capacitor Clock ($6750), and which came from LPs played on a VPI Bespoke Prime turntable ($10,000) with Van Den Hul Crimson Stradivarius cartridge ($5400)-I’m sure someone will call for my beheading for such a mortal sin-but I really enjoyed the very clear, open sound on Steely Dan’s “Babylon Sisters” and Eric Clapton & B.B. 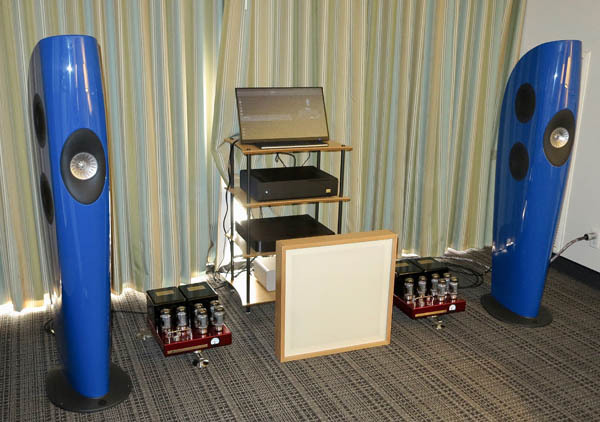 King’s “Three O’Clock Blues.” Deserving equal credit for the achievement are Ayre’s EX-8 integrated amplifier ($7850), QX-8 digital hub ($5450), and P5 phono preamp, along with a Wireworld Silver Eclipse cable loom and TAD Labs Mirco Evolution 1 speakers ($10,000/pair). Chris Trojnar, Southeast Regional Sales Manager of Harman Luxury Audio, paired with retailer Audio Advisors to set up the best Mark Levinson/JBL demo I’ve heard in a long time. 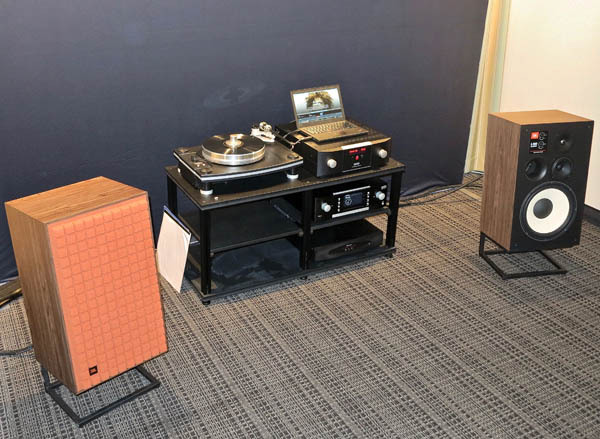 The system was headlined by JBL L100 Classic speakers ($4000/pair) and a Mark Levinson 5805 integrated amplifier ($8500), fed by Mark Levinson’s No.519 media player ($20,000) and No.515 turntable with Ortofon Cadenza Bronze cartridge (a $12,500 bundle, or $10,000 for the table alone). Transparent Audio cabling and power conditioning completed a chain that, despite a bit of boomy bass on the National Symphony Orchestra’s recording of Capriccio Espagnol, sounded very right throughout the rest of the frequency range.